As the smart phone has become the major device for business communications, it has become equally important for developers to determine some of the methodologies that could be used to develop mobile applications. Such methods include the agile methodology and other methods as well. The smart phone is quickly becoming the main device used for business communications. The technology enables businesses to reach potential and existing clientele in an innovative and new way. The same as other business, mobile app development has technological enhancements and innovations that make a trend for as long as there is something better in place. In mobile app development, clearly, the agile development methodologies are getting more popular compared to the traditional waterfall development method. Developers of agile methodology and app development companies offer early and ongoing software delivery, application modules in a few weeks. There is constant interaction and alliance of the developers within the business owner or enterprise. Clients could request modifications even during the later development stages, which is paramount to meet market challenges and to enjoy a competitive advantage in the marketplace. Agile project management is more a goal based management instead of a collective project management. This kid of management allows using the full potential of the sources as each one could have mastery on one aspect of the app and less or even no understanding of the other. Native application. Creating a native app means separate development for every mobile device. The advantage of designing an application entirely from the ground up for a native platform is that one could optimize the feel and look of every application for every device, pushing every hardware to the limit. Obviously, the drawback is that the code should be developed independently for every platform and the same app should be programmed in multiple languages. This costs most and takes a long time to develop. However, one has complete control over the UI or user interface for every device. Cross-platform method with a development platform. Developers who are familiar with .NET do not have to switch to Objective-C to develop for Java, iOS, J2ME for Android and other platforms. Rather, they could use the open source and free project, Mono, that could be run on iOS, Android and a lot of other operating systems. Users of Mono could develop using Visual Studio than XCode and could use a personal computer instead of a Mac to develop Apple products. The ability of developing using a preferred language minimizes the skill requirements and infrastructure expenses to develop for both Android and iOS. The disadvantage is that because every device uses different operating systems and hardware, the app may not be user-friendly and optimized for every native platform. Nonetheless, the UI layer code could be made for every app device, and business and data layers could stay consistent upon using the right architecture. Mobile app development is constantly a moving target. Every six months, there is a new mobile operating system that has unique features that are only accessible with native APIs. 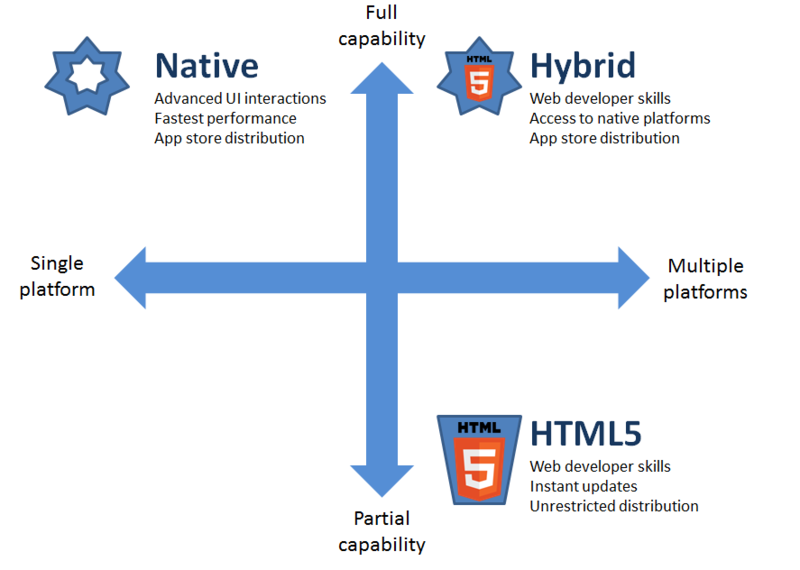 The containers bring the hybrid apps soon thereafter, with the web making great leaps every year. Indeed, there are different methodologies that could be used in developing mobile applications.